Few trees conjure up the grandeur of the Old South more than a mature southern magnolia tree. 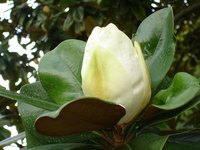 Sixty to 80 feet tall, with glossy green evergreen leaves and huge white flowers that perfume the late spring air, the southern magnolia (Magnolia grandiflora) or bull bay is not difficult to grow from seed, although seedlings may take as many as 15 to 20 years to begin blooming. Close cousins to the southern magnolia are two smaller deciduous magnolias, the saucer magnolia (Magnolia soulangiana) and the star magnolia (Magnolia stellata). Both trees are more cold tolerant than the southern magnolia, but the early spring flowers are susceptible to frost damage. They can also be started from seed, although seed production is not as abundant as with the southern magnolia. The process of starting magnolia seeds is the same regardless of the type of tree. Commercial seedsmen rarely carry magnolia seeds because they are difficult to store, so your best bet is to collect seeds from a nearby tree in autumn. After blooming, magnolias develop a seed pod that looks similar to a pine cone but is actually called an aggregate of follicles. The bright red or orange seeds are underneath each scale-like follicle. Collect the seed pods as soon as possible after the fruit is mature, usually in mid-September to early October. If the seeds are not yet visible, spread the pods out to dry in a shady area until the follicles open to reveal the seeds, then shake the seeds into a bowl or other container. Magnolia seeds need a three- to six-month cold period in order to break dormancy, so if you live in an area where winters are cold, you can plant the seeds outside immediately. The red or orange fleshy seed coat must be removed before planting. Soak the seeds overnight, then rub off the coating. You may need to rub the seeds against a scrubbing pad or piece of window screen to get the fleshy material off. Choose a site with rich, moist soil slightly on the acidic side (pH less than 7.0). First-year seedlings appreciate a partially shaded location, but mature trees like full sun, so it is best to start the seeds in a nursery bed and then carefully transplant them into their permanent position in the spring of their second year. Cover seeds with 1/4 inch of soil and mulch to prevent drying out, since the seedbed must be kept moist until the seeds germinate in the spring. Be sure to mark the location well. Magnolia seeds deteriorate rapidly if not handled properly, so it is best either to plant the seeds immediately or to stratify them for spring planting. Stratifying means artificially giving seeds their required cold period so they will break dormancy and sprout successfully. However, if you can't plant the seeds immediately but do plan on doing so soon, let the pulpy seed coat dry out until the seeds look like raisins, then store them in an airtight container at 32 to 40 degrees F (the refrigerator is perfect). When ready to plant outside or in pots or to stratify for spring planting, soak the seeds for several days until the seed coat is soft enough to remove. If you live in an area without cold winters or just don't want to bother with planting the seeds in the fall, you can stratify the seeds in your refrigerator. You will need moist peat moss and a cool location of 32 to 40 degrees F. Most people use their refrigerator, although you can use a cold frame if it gets cold enough. Clean the fleshy seed coat off the seeds by soaking overnight and then rubbing the coat off. Moisten peat moss until it holds together but is not so wet that it drips, then alternate layers of peat moss and seeds inside a poly bag. Close tightly and store in the refrigerator or cold frame for three to six months. Whether planted directly in the fall or after winter stratification in the fridge, start magnolia seeds either in a semi-shaded nursery bed or in gallon pots. For pots, use a quality potting mixture. For a nursery bed, pick a spot with moist, rich soil with soil pH less than 7.0 (slightly acid). Cover seeds with 1/4 inch of soil, then mulch to conserve moisture since the seedbed must be kept moist until the seeds germinate, which may take four to six weeks. After germination, keep plants moist but not soggy and protect them from hot midday sun. Fertilize lightly in spring but not later in the year since you want all growth to harden off before cold weather. Plants started in pots may need winter protection. Move plants into their permanent sunny position in the spring of their second year, being careful to keep the root ball undamaged. Southern magnolia is hardy from USDA zones 7 (6 with protection) to 9. Both star and saucer magnolias are hardy from zones 4 through 9. Do not attempt to keep seeds over winter at room temperature. They will lose viability and will not germinate once planted. Some people develop a contact dermatitis rash when handling magnolia seeds. Using rubber gloves is a good precaution. Seeds taken from named varieties are often less viable than seeds from species plants, plus seedlings may differ markedly from the parent plant. Expect variations in size, bloom color and so on.